If you've ever had a brand new shower head, you know how luxurious it feels to have a powerful stream of water during a shower. Some of today's shower heads are large enough to make you feel that you're in a rainforest and powerful enough to deliver a massage worthy of the best masseuse. Then one day you notice that the shower head is delivering something more like a trickle or a misty spritz. This is a sign that it's time to clean your shower head. The minerals in water can build up and block the openings. The blockage can even prevent the interior of the shower head from drying completely between uses, encouraging mold, mildew, and bacteria to grow and become airborne with the next use. No one needs that. A shower head should be cleaned at the first indication of reduced water flow. The frequency is highly dependent on your water supply. 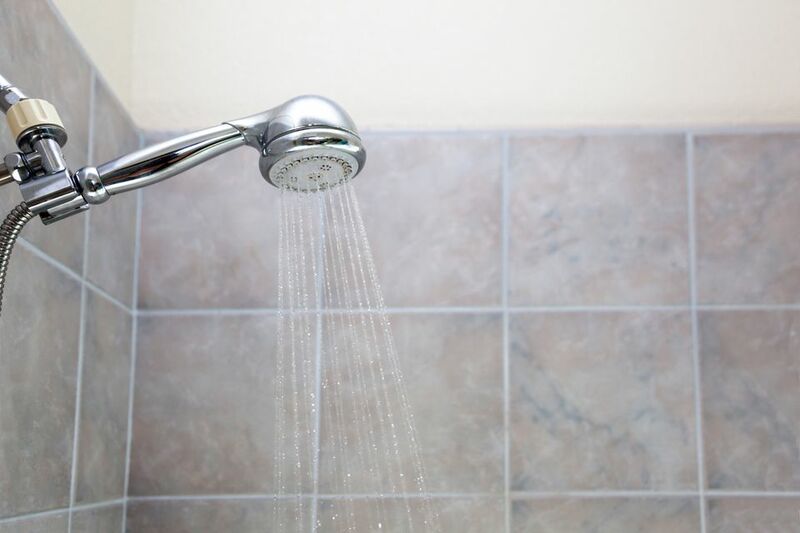 If you live in an area with hard water or water with a high level of calcium and magnesium, the more often you'll have problems with a clogged shower head. 85% of homes in the United States have hard water. Municipal water system officials can give you the mineral content in your water supply and home tests are available if you use a well water system. Once you have done a thorough cleaning of the shower head, a bi-weekly or monthly cleaning with a commercial cleaner like CLR or distilled white vinegar will keep minerals at bay. Simply spray the solution on the shower head, give the spray nozzles a scrub with an old toothbrush to dislodge any minerals, and run the shower for a few minutes to rinse it all away. The good news is that the vinegar will also help remove any soap scum that may have accumulated on the shower head fixtures. It's best to remove the shower head from the shower arm, if possible, for cleaning. This process will also work for handheld shower heads. Use a soft cloth to cover the nut or ring connecting the shower head to the shower arm to prevent scratching the finish. With the cloth in place, use an appropriately-sized wrench or locking pliers to loosen the nut. Place the shower head in a deep dish or bucket. Pour enough vinegar to completely cover the shower head into a microwaveable bowl or saucepan. Heat the vinegar until warm to the touch. It does not need to boil. Pour the warm vinegar over the shower head in the bowl. Be sure the entire head is submerged and allow the vinegar to work for at least 30 minutes. Remove the shower head from the vinegar. Use an old toothbrush to scrub away any stubborn deposits still visible in the nozzle openings. A toothpick or safety pin can be helpful in clearing any deposits from the jet holes. This is a good time to remove and clean any filter screens that may be located in the head. If the deposits do not come off easily, repeat the soaking process with fresh vinegar. When the shower head is clean, replace it on the shower arm. Remove any old plumbing tape and apply new tape to ensure that there are no leaks and that you have a good seal. Quite often the shower head joint is so crusted with mineral deposits, that it is impossible to remove it from the shower arm. There's still a way to give it a good cleaning with a bit of patience. Pour at least one cup of distilled white vinegar into a large heavy-duty plastic bag (a food storage bag is a good choice). Use enough vinegar and a bag that is large enough so the entire shower head is completely covered. Secure the bag to the shower arm with a rubber band or some masking tape. If you are using tape, try to keep it away from the metal finishes of the fixture. It can be difficult to remove and may mar the finish. Allow the shower head to soak in the vinegar for at least four hours. Overnight is even better. Cleaning takes a bit longer since the vinegar cannot be heated. Remove the bag and wipe down the shower head with a soft cloth. If mineral deposits are still visible, scrub the openings with the old toothbrush dripped in some vinegar. Use a toothpick or safety pin to remove any deposits clogging small jet openings. Turn on the shower for a few minutes to rinse away any remaining debris. If the shower head is still clogged, repeat the steps with fresh vinegar.